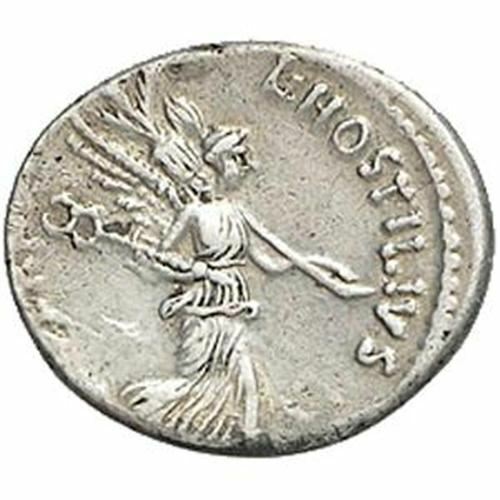 L. Hostilius Saserna was one of the moneyers for the year 48 BC - he is not otherwise known. The gens Hostilia was an ancient family at Rome, which traced its origin to the time of Romulus. The most famous member of the gens was Tullus Hostilius, the third King of Rome; however, all of the Hostilii known from the time of the Republic were plebeians. Obverse: Bare head of Gallia (or Pallor?) right, wearing long, dissheveled hair; carnyx to left.